Junckers solid wood flooring creates striking circular floor for landmark pleasure dome ..
Junckers solid wood flooring has been installed at Spanish City in Whitley Bay as part of major refurbishment works. 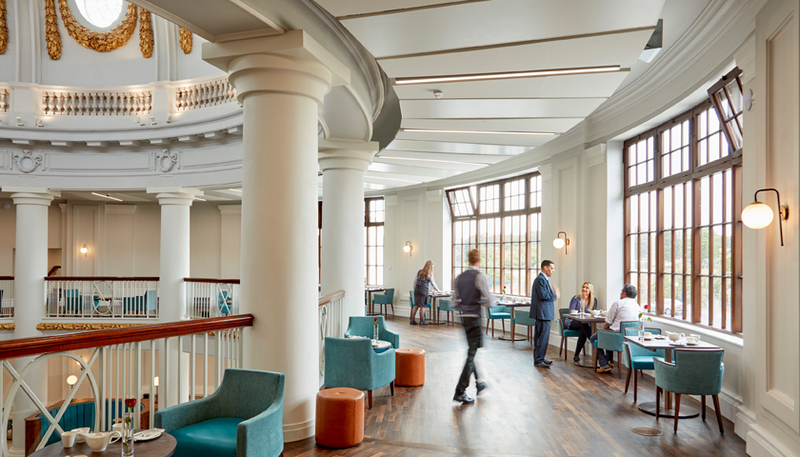 Architects, ADP, brought the seaside pleasure building back to its former glory by carefully restoring original decorative features in the Grade II listed building. The works included revealing the magnificent dome in the rotunda by removing a mezzanine floor, restoring the triple height ceiling to create a large, circular space. The grand room required a complimentary floor and the choice fell on Junckers’ Black Oak, which has been fitted in a striking concentric dodecagon pattern. Installed by Junckers’ Approved Contractor Stenhouse Flooring, the project features mitred joints which require a high level of skill and experience. Junckers’ solid wood flooring was also installed in several other areas in the building, which now includes bars, shops, restaurants and a suite of rooms for events, conferences and weddings.